It's Up to You in Chinese | Whatever You Say Goes! You Decide! 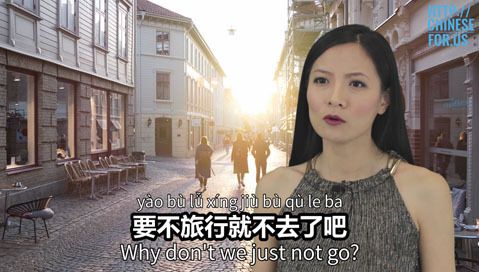 What if you and a friend need to make a decision and you want them to decide, How to respond in Chinese like a native? 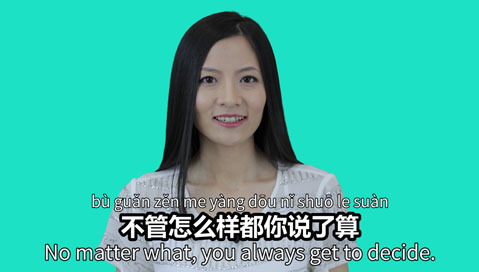 In this short video lesson you will learn how to say it's up to you in Chinese. There are two short dialogues and also one example sentence where you can say whatever you say goes in Chinese. Feel free to click the slow audio for the words used in the dialogues. Whatever you say goes! You decide! when you and a friend(s) need to make a decision and you want them to decide. 听你的。tīng nǐ de. I'll listen to you. 你说吧。nǐ shuō ba. You say. 你来决定。 nǐ lái juédìng. You choose. You decide. It's up to you. 你说什么就什么。nǐ shuō shénme jiù shénme. Whatever you say we'll do. This year, would you rather travel to Japan or Korea? Actually, we don't have that much money. Why don't we just not go? Okay, whatever you say goes. No matter what, you always get to decide. You are more than welcome 🙂 !!!!! Really? 😀 I was looking for free stock photos that have city scenery and found these ones. It’s such a beautiful place! Must be nice living there! I wish I can visit someday.